Select Size 18" x 20" 20" x 24" 24" x 36"
W 6.0" 6.25" 6.5" 6.75" 7.0" 7.25" 7.5" 7.75" 8.0" 8.25" 8.5" 8.75" 9.0" 9.25" 9.5" 9.75" 10.0" 10.25" 10.5" 10.75" 11.0" 11.25" 11.5" 11.75" 12.0" 12.25" 12.5" 12.75" 13.0" 13.25" 13.5" 13.75" 14.0" 14.25" 14.5" 14.75" 15.0" 15.25" 15.5" 15.75" 16.0" 16.25" 16.5" 16.75" 17.0" 17.25" 17.5" 17.75" 18.0" 18.25" 18.5" 18.75" 19.0" 19.25" 19.5" 19.75" 20.0" X H 6.0" 6.25" 6.5" 6.75" 7.0" 7.25" 7.5" 7.75" 8.0" 8.25" 8.5" 8.75" 9.0" 9.25" 9.5" 9.75" 10.0" 10.25" 10.5" 10.75" 11.0" 11.25" 11.5" 11.75" 12.0" 12.25" 12.5" 12.75" 13.0" 13.25" 13.5" 13.75" 14.0" 14.25" 14.5" 14.75" 15.0" 15.25" 15.5" 15.75" 16.0"
Why choose to buy mirrors online with us? 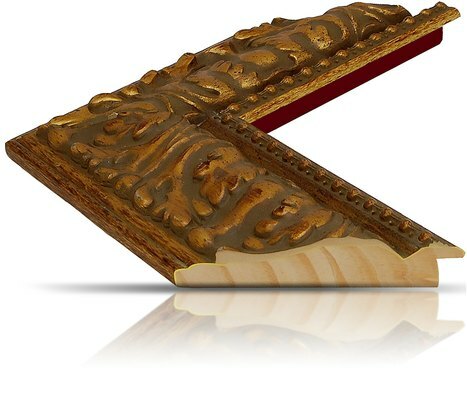 Traditional-style custom mirror framing from FrameStoreDirect takes inspiration from the 18th and 19th centuries. The rich woods and ornate designs used in our mirrors make the ideal accessories for living rooms, dens, libraries and bathrooms. 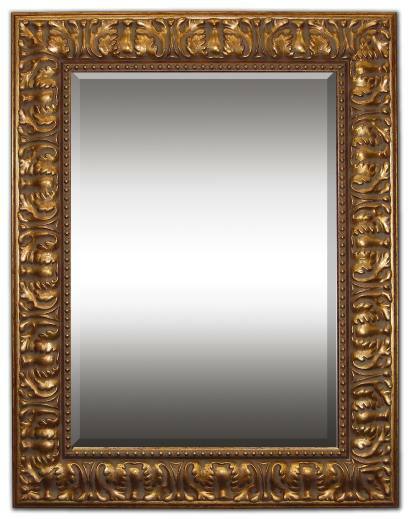 The ornate gilded scrollwork of this mirror speaks to traditional 19th century European influences. Bring the tradition and sophistication of centuries past into your home. 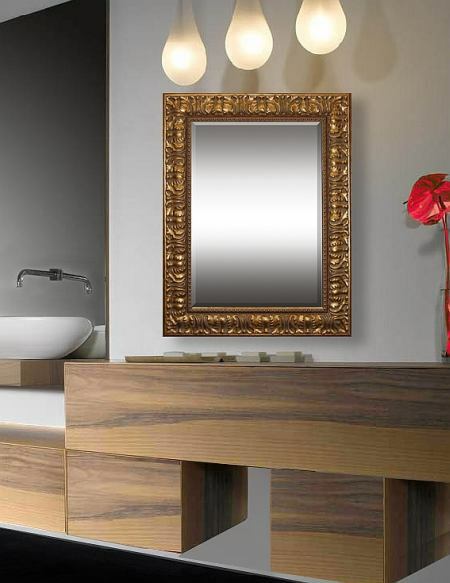 Buy our mirrors online. 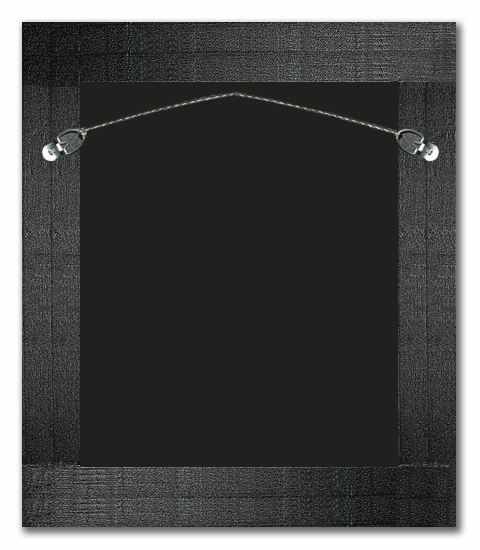 Shop for more mirror frames today. 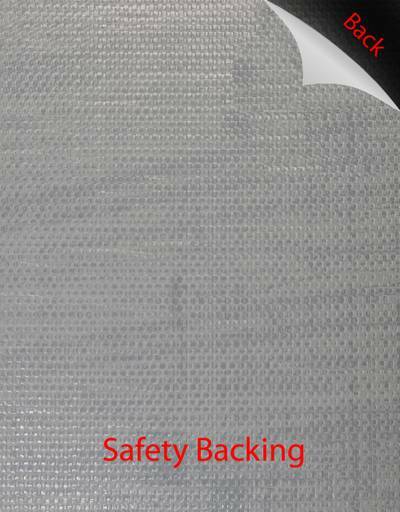 * If breakage occurs, glass fragments are held in place to reduce the risk of injury from scattered glass and make cleanup easier. * Strengthens the mirror overall, increasing impact strength to help prevent breakage. * Prevents moisture entrapment to keep mirror from delaminating. We guarantee that all our designs are handcrafted in the USA made from only the highest quality museum-grade materials available. to compare, but how can they? All content copyright © 2012 FrameStoreDirect.com All rights reserved.